Baby Alive « Mostly Domesticated. Greetings! Before I fill you in on our big news, let’s get reacquainted. It’s been 3 weeks since my last post. Utterly unacceptable. I’m not sure how I got to this point. Oh, I know. Christmas hoopla, New Year’s hoopla, New Year’s Day Flood in my Basement, the Flu, and so on. I’m just glad to be back. Actually, what has really hindered my progress lately, is the Honey Badger. Her school is undergoing construction, and they had to extend “Christmas Break” until 1/14/13. She’s not real hip on going with the flow; she marches to the beat of her own drum. That pretty much consists of wearing PJ’s no matter what time of day. And, since it’s winter, she likes her silk, sleeveless nighties best of all. (During the summer, she wore only footed fleece pajamas.) Honey Badger don’t care what season it is. She likes to wear her PJ’s wherever we go, and pack about 3 extras in her bag. She likes those extras in case of an emergency. Getting her out the door is literally most of the battle. After that, she’s a happy little camper. Once we step foot back in the house, though, she disappears to her bedroom to get new PJ’s on before you can blink your eyes. She’s a very complicated HB. Let’s stop here for a moment. Lots of things were going through my head, but the intent, imploring, naive face was too much. I felt awful. It needed to hear the truth, and quickly. Um, negative. “You need to get MARRIED first!”…..says the mother that had a child out of wedlock and we both turned out just fine, thank you very much. “Oh! !,” it exclaims, as the light bulb goes off in its head, and it runs to its room to pull out all of the baby things I’ve ever saved for her. “The baby can wear THISSSS!!! !”…..she proclaims it. So loud and proud to be getting ready for the baby’s arrival, which is set to come, in her mind, at any moment. Quite possibly, the scariest part of this entire scenario, is that for the next 30 minutes, she dragged out things that were exactly what a baby would need. She was spot on. Bibs, sleeping, eating, clothes, I mean, we are covered. Honey Badger is not playing games!! To take a break, I interrupted the imminent arrival of the baby to make some banana bread. I thought it might distract her. It did. Until bedtime. Her poor Daddy is sick in bed with the flu. He had a rough day, and went to bed at 6:30pm. I got everyone fed, Dylan’s homework and studying done, then I thought both kids were in bed, and I was working in silent bliss. I quietly made it to her room to investigate. I caught her playing in mid-act. Discovered, it blurted out, as if we were so stupid to not think of it before, “THE BABY NEEDS BABY TOYS!!”. I guess we’re not over it. She was tripping over her words and excitement to tell me what more she has stockpiled for The Baby. It all might as well go into a time capsule, because this baby isn’t coming anywhere near us for another 20 years. We will make do with her Christmas gift of Baby Alive (AKA “Baby Shits Her Pants”, “Baby Chokes on Food That’s Been Caked on For Many Days and Hardens”, or a plethora of many other colorful names). Ah, well, what can you do. 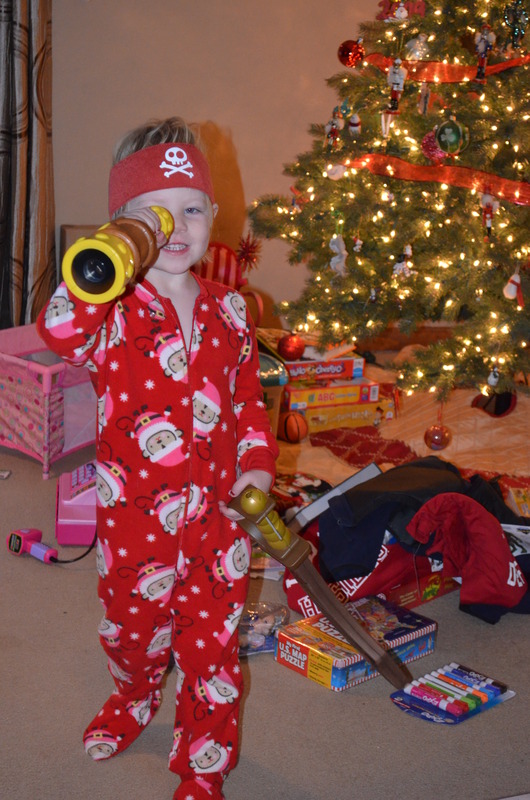 Here is a picture of my Modern Day Mother Warrior…..in her, uh, Jake & the Neverland Pirates outfit from Xmas. I’m sure she’d make an awesome Mommy right now. I mean, Flash is still alive and that’s HUGE. 5 Comments Posted in Uncategorized Tagged Baby, Baby Alive, Changing table, Children, Christmas, Honey Badger, Jake & the Neverland Pirates, New Year, Shopping, We're having a baby! Christmas is drawing near, and so is the end of Baby’s stint here on earth, I’m afraid. Baby is Erin’s doll. She goes practically everywhere with us. (See example from Halloween here.) Baby has had it pretty good, despite being perpetually dirty, and never having any clothes on. These small imperfections matter not. She is lacking in a couple of areas, though; she doesn’t eat and she doesn’t crap her pants. Erin is asking for Baby Alive for Christmas. Or, Baby Shits Her Pants, as my sister calls her. It’s only a matter of time before somebody puts Baby in the corner. Permanently. Yesterday, Erin, Baby, and I went to the park. I took the time to document what might possibly be one of Baby’s last hurrahs. I feel kind of sorry for her. As you will see, she had a really great time with us. Baby on the slide. Weee! Baby on the swing. I think she likes the swing best because HB sends her flying so high. Baby on the rings. She doesn’t really care for the rings, but she rarely stands up for herself. Like never. Sadly, I think she will miss the choke hold from the Honey Badger most of all. Well, that’s it for our fun day at the park. We have other pictures, but those are just between us. It’s been a fun ride, Baby. We’ll see you on the flip side. Or we’ll see you flipped over, or on your side, under the bed, or stashed in the corner closet, come December 25th. You’ve been a heck of a pal.